Okja is a wild, tender tale of wonderment and friendship, delightful but still with smacks of vile consumerism darkness. Bong Joon-Ho’s Okja offers more than just an insta-famous superpiggy and a commentary on consumerism. Joon-Ho tells a delightfully dark tale of innocent love and test-tube bacon, equal parts cartoonish and introspective. Tenderness coaxes a feeling of soulful compassion, as Joon-Ho scores action to a polka-like bounce. Scenes are erratic, energetic and enslaved to satire that feels like a warm hug (until one intentionally crushing turn). Think Babe meets scientific experimentation, with a healthy dose of a show-stopping Jake Gyllenhaal. And we’re mad at Netflix? Maybe if studios gave their directors even half the freedoms Joon-Ho enjoys, they wouldn’t be defecting – and with results like this, I say let ’em. In 2007, Mirando Corp. CEO Lucy Mirando (Tilda Swinton) announces a competition that’s aimed to produce a new sustainable meat source. She assigns 26 “miracle” piglets to selected farmlands within reach of international corporate offices, all of whom are competing for the title of “Best Super Pig.” After ten years, famed nature personality Dr. Johnny Wilcox (Jake Gyllenhaal) is to crown a victor, who will be flown to New York for a special celebration. Audiences cheer, investors grin and so begins the great piggy race! Fast forward 10 years and we visit Korea’s appointed farm and their prized swine, Okja. Dr. Johnny is on his way to judge her progress, but there’s a problem. Young Mija (An Seo-Hyun) has grown alongside Okja, from the ages of 4 to 14. She thinks her caretaker paid off Mirando in order to keep Okja, but such is not the case. Dr. Johnny declares Okja the winner, and so begins her quest to New York City. Lucy’s plan to glamorize her mass-produced food source appears complete, until a coalition called the Animal Liberation Front stages a rescue – with Mija not far behind. Can the ALF expose Mirando’s unsavory methods of superpig creation? Or will Lucy Mirando go down as a pastel-clad genius? On points of consumerism and greed, Okja invites outrage. Lucy’s superpig solution could prove sustainable as Earth’s resources deplete, but buyers are terrified of GMO products. Why not gussy up these gargantuan porkers and make them into lovable oafs? No one can resist parades, inflatable pig balloons and piggy-ear hats! This is the light that hopes to shine away what darkness lurks in Paramus, NJ, where creatures like Okja are subjected to unspeakable slaughterhouse tortures. Even Dr. Johnny – a certifiable nutjob made from Billy Mays and Ryan Seacrest DNA – is broken by the atrocities Mirando forces him to commit. This is the duality of Joon-Ho’s vision, when carnival processions lead into degrading animal treatment practices. As a loving portrait of unbreakable friendship, Okja warms the deepest cockles of the most frigid hearts. An Seo-Hyun connects to Joon-Ho’s CG piglet like she’s present on-set, not just in digital pixelation. Whether Muija rubs Okja’s bottom so pooplets shoot out or is dragged kicking-and-screaming by Mirando security, Seo-Hyun makes us believe in Okja’s bond. Mija stands there – bloodied and with a swollen black eye – because Okja isn’t just a future Wal-Mart product. With each hug and cuddle, we’re reminded of the same love we might have felt for a pet or wounded animal. It’s both a dagger straight to the viewer’s heart (empty moments of separation) and uplifting reminder of life’s enveloping beauty (joyful reunions). Sweeter than candied bacon. Then there’s the connectors – Paul Dano’s ALF ringleader (beholden to pacifism and moral codes), Giancarlo Esposito’s nearsighted Mirando sleazebot, Steven Yeun’s commitment to cause. Focus keeps on Seo-Hyun border-crossing adventure, but objectives are much larger than one girl’s dream. Dano’s immediate softness towards Okja promotes him as an ally, while Esposito’s venomous grin makes him an enemy even to Lucy. Their intricacies represent smaller ideals that branch off Joon-Ho’s broader themes, be it ALF members who refuse food consumption in any form (all byproducts) or a mousy Mirando PR rep who blindly acts in the name of Lucy’s manipulative scheme. They’re cogs in a larger machine who continue pushing forward in the name of past systems, unable to shake instilled programming (Lucy’s still haunted by her father’s despicable behavior as CEO, for example). Now, for something a bit different. I sit here trying to find a fitting way to bring up Gyllenhaal’s Dr. Johnny Wilcox, but words cannot capture such theatrical outlandishness. There is no use. Imagine the whistles-and-confetti pandemonium of Rip Taylor and the energy of Richard Simmons crammed into khaki thigh-high/blazer/knee-sock combos. A bushy caterpillar mustache, and camera-hogging reactions akin to those wavy-armed balloons in front of car dealerships. You have not seen WILL NOT SEE a more passionate, transformative performance than Gyllenhaal’s battier-than-a-belfry tumble from well-respected animal expert to disgraced Mirando mascot. Taking his aggravations out on Okja, or cursing co-workers he drunkenly forgets are behind double-sided glass. All eyes were on Gyllenhaal once those New York set photos surfaced during production, and by the beard of Captain Kangaroo, Dr. Johnny Wilcox delivers far beyond our wildest expectations. 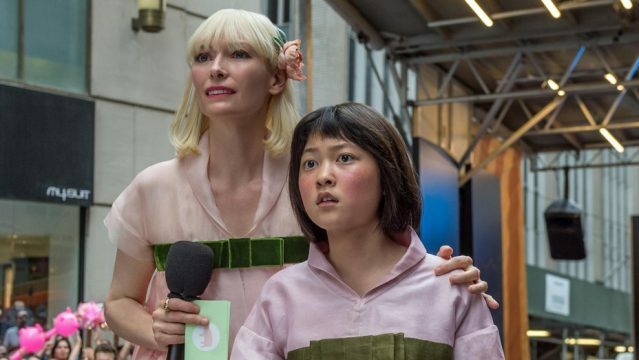 It’s this same uptempo chaos that gives Okja its greatest charms, always persisting even when society fails. Credit the music department for keeping most characters fleet of foot, plucking strings and punching deep-brass notes. Okja may be barreling through a subway storefront – leaving a path of destruction – but never do we lose a coy grin. Maybe it’s the lovable animation, or the adorable savior girl, or the infectious oom-pah soundtrack, but it all pleases the senses. Hope builds, inflating like a balloon that awaits the sharp prick of reality that cannot be escaped. This may be Joon-Ho’s greatest trick. Massaging a bubbly, respectable zaniness, only to drop audiences stomachs all the way down into their toes. There’s so much to ponder about Bong Joon-Ho’s Okja. Commercialism and coexistence are just the tip of the iceberg. When Mija (a child) sees Okja, she sees another being – but when Lucy (an adult) sees Okja, it’s just a slab of meat? Or what about corporate sellouts like Dr. Johnny Wilcox – is there honor among dollar signs? I might contest that a few moments suffer from a commitment to comic daffiness, but Joon-Ho is a tremendous storyteller who captures human essences in the most absurd elements. It’s all worth it when Mija embraces her larger-than-life best friend, cuddling together after another hard day’s work. A girl and her post-production-added superpig. Tantalizing, for all the right reasons.